Another big novel, and this was one I’d been waiting to get my teeth into for quite some time. For the last bunch of books, we’d seen Horus as a fairly distant character; one who seemed to be letting all his brother primarchs have all the fun. Horus had appeared in cameos in plenty of other books, but never as the hero of his own story, never as the instigator of events. In short, he’d lost his agency, so this novel was a chance to get him back in the driving seat of the rebellion that bore his name. In writing this story, I wanted to capture the sensibilities that permeated the opening trilogy, the sense of a golden age coming to an end and that great players were deciding the fate of the galaxy. Dan had brought the Mournival back together in Little Horus, and now it was time to see them in action. And where better than on Molech? A world that had last appeared in a piece of Traitor Knights background written by Gav Thorpe for the Epic game system. I’d been looking for a BIG WAR to set the story against, and this piece fitted the bill perfectly, especially with the resurgence of Knights in the background and on the tabletop. But more than just a battlefield, Molech needed to have something more to it than just another stepping stone for the Warmaster. It needed a secret, and it seemed clear that it needed to be something big, something that would tempt Horus to send almost his entire legion to get it, something that necessitated so large a force of defenders. It needed a trace of the Emperor. In previous Horus Heresy meetings, we’d discussed how the Emperor had actually created the primarchs, the bargains he’d had to make and the deals with the devil that went into the birth of such demi-gods. Where had the Emperor gotten that sort of power and how had he reached it? Those were questions we (or at least Horus…) would find the answers to on Molech, and though a few people have asked me if we’ll ever read the ‘what Horus did on the other side’ stuff, my answer would be only if we could do it justice with a trilogy (or more…) of its own. So, with Horus as part of the story, the next part was the return of Loken. We’d last seen Loken (more or less) as a broken man on Isstvan III, being brought back into the fold of the Imperium by Nathaniel Garro. He’d taken part in a mission to Caliban, though that hadn’t ended particularly well, and was now broken and slowly rotting in a biodome on Luna (as seen in Luna Mendax). Well, the chance to get him and Horus in the same room was too good to pass up, as was the chance to see how Loken was coping with being nearly killed by his former comrades, buried alive and then being forced to venture back into the belly of the beast. Not well was the answer to that. And the final moment where Loken makes his choice and gives his version of ‘We will fight them on the beaches’ speech was a story highlight of mine. There’s a few other points that bear going into as well. Sometimes in Horus Heresy novels we leave deliberate gaps in our narratives. Sometimes just to give ourselves wiggle room, other times to allow someone else to fill it in. And sometimes it’s because you know of a story or a desire for a story coming from another author. But sometimes those stories won’t get written for a while, thanks to increasingly full schedules and other projects occupying the various writers’ time. 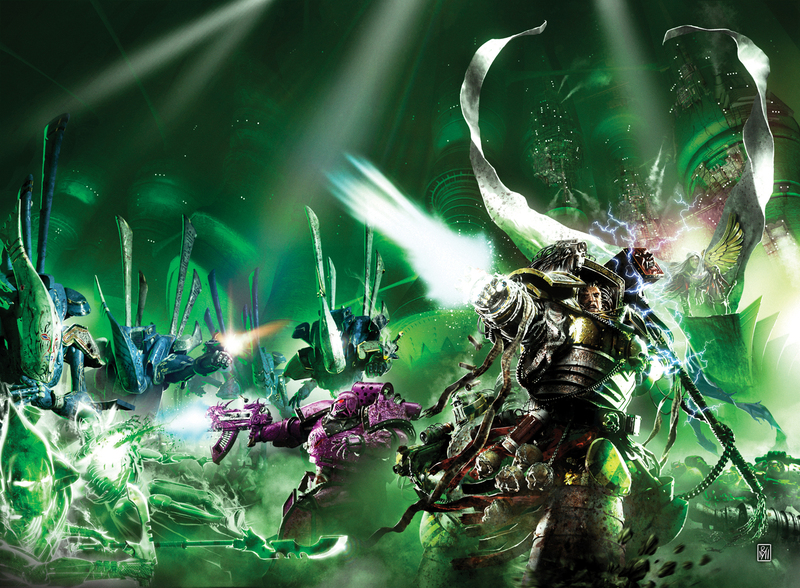 So that goes some way to explaining why you see Russ on Terra when we last saw him hip-deep in Alpha Legionaries, and why Mortarion is somewhat more comfortable with the idea of daemonic presences that you might otherwise expect. Chris Wraight has stories in mind that dovetail nicely with Vengeful Spirit.